Atlantic South Region: Dog Days of Summer! It has been a hot and humid summer in north Georgia. 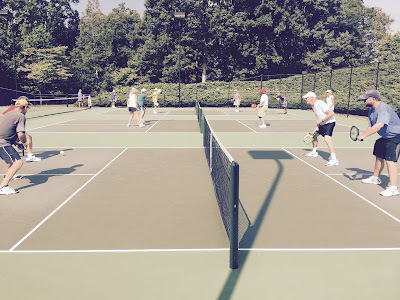 Nevertheless, the North Georgia Pickleball Club has had excellent play and our players have enjoyed a dip in the pool occasionally after playing 3+ hours in the morning! Players have also enjoyed cantaloupe, eggplant, cucumbers, and tomatoes from our garden and we hope to continue feeding our players through the fall garden project! Tom Earley held a strategy and technique clinic for our players and hopefully will hold another similar clinic in October. This month we also held our last referee class and now have top quality referees to work in upcoming fall tournaments and simply be more aware on the courts of all rules. We were very happy to have several visitors over the summer – Kathy and Gary Baker from St. George, Utah, and Vivian and Edwards from Colorado most recently. Please put down the dates of September 25-27 as our 10th anniversary pick up all tournament. On Wednesday, September 23, Rodney Grubbs of Pickleball Rocks will bring out several pickleball paddles to review and allow our players to sample. Pickleball Rocks will also be a vendor at our tournament over the weekend. On Friday, September 25, we will have open play from 2 PM until 6:30 PM. If you aren't playing in the tournament, please join us to support our players and enjoy some top level play on Saturday and Sunday. If you get up early – 8:30 AM on Saturday – join us for a great opening ceremony featuring the local high school band, Junior ROTC, and local dignitaries. All entry fee proceeds will be donated to the Cherokee animal shelter and Sheriff Joe Arpaio's M*A*S*H unit. Until further notice, we will play every Monday, Wednesday, Friday, and Saturday at 9 AM until there are no more players on the courts – normally around 1 PM. Hope to see you on our courts soon!